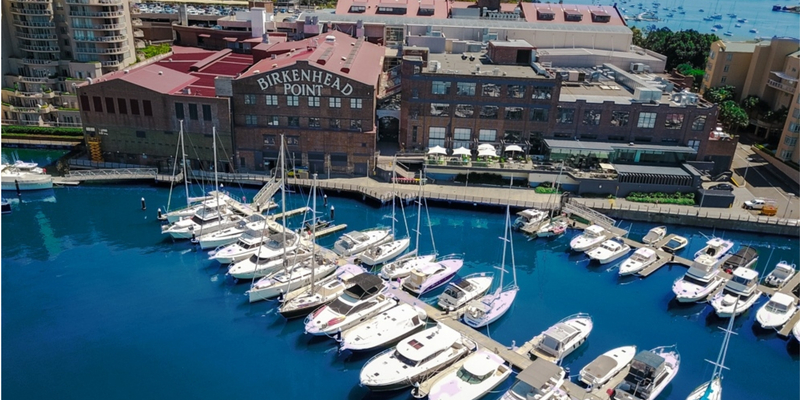 The brand new Birkenhead Point Marina has been awarded the highest possible accreditation under the Global Gold Anchor Scheme with 5-gold anchor platinum status. This is the first marina in Sydney Harbour to achieve this status. With only seven marinas across the world now holding the coveted title, it recognises the marinas abundance of luxury, unrivaled location on Sydney Harbour and its world-class members facilities. Birkenhead Point Outlet is located on Sydney Harbour just 5 kilometres from the CBD, within the waterside suburb of Drummoyne. The rejuvenated centre is home to over 150 specialty stores including global luxury giants Bally and Harrolds, as well as designers Coach, Michael Kors, Zanerobe and Australia’s Peter’s of Kensington. Premium apparel offerings also include Armani Outlet, Hugo Boss, Polo Ralph Lauren, Oroton, Furla, Tommy Hilfiger and Calvin Klein; along with a broad range of global sportswear and Australian designer brands. The outlet includes a convenience precinct offer with Coles, ALDI, a Medical Centre and Fresh Food retailers. Adjoining the outlet is Birkenhead Point Marina, the largest privately owned marina on Sydney Harbour, including over 200 berths. Mirvac Retail owns and manages a dynamic portfolio of shopping centres across Australia’s eastern seaboard with total assets under management of over $4.0 billion. Incorporating over 400,000 square metres of retail space and more than 1,600 retailers, Mirvac’s centres have strong positions in their local markets with geographic, retail and economic diversity. The centres are individually branded, marketed and positioned to suit the specific needs of its customers in each of their unique catchment areas. Mirvac is a leading Australian property group, listed on the Australian Securities Exchange ASX. Mirvac’s investment portfolio has interests in office, retail and industrial assets, while its development business has exposure to both residential and commercial projects. With over 45 years of experience, Mirvac has an unmatched reputation for delivering quality products and services across all of the sectors in which it operates.